This week at Try It On Tuesday it's Monochrome week. I chose to go black, white, and silver. I hope those little hearts show up silver on your computer. I have to confess they were red to start with, but red is not a shade of black, so they got changed to silver. One Stop Card Crafts is sponsoring this week, they have lots of neat stuff and have some good clearance going on right now. At Less Is More we're seeing double by stamping a stamp twice. 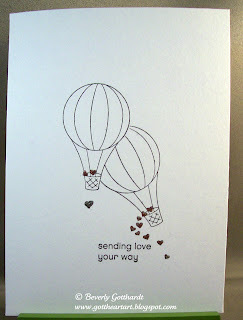 This particular stamp and sentiment are one piece, so I masked off the sentiment and hearts and stamped the balloon on the left first. Then I masked that balloon and stamped the whole stamp. 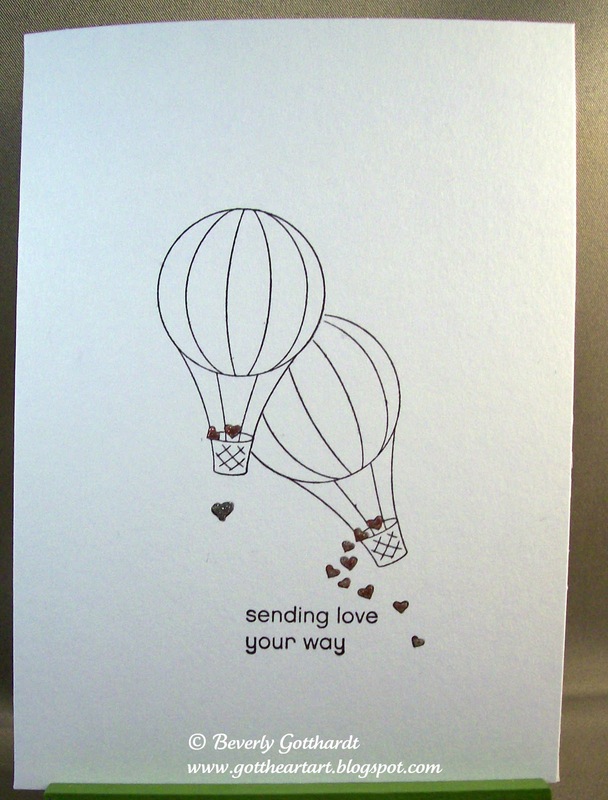 The one lone heart below the left balloon is stamped to cover up a stray ink blot. Sometimes I think you have to stretch your thinking processess just as much to get an effective Less Is More card as you do to get a much more layered card. I'm enjoying these simple cards for a change. Supplies: White Card Blank 4" X 5 1/2" The Paper Studio, Stamp: SU-Ain't Love Grand, Ink: Ranger Archival Ink-Jet Black, Sakura Gelly Roll Pen-silver. Great card Beverly... neat bit of stamping here. Lovely card, well done. You can view my card here . Beautiful and effective CAS card! Love it!